Previously I wrote, Dotty Update, Playing Hookey, Saturday in the Park. I suggested that readers go out and have a good time. I also suggested that you could send in a picture, video or podcast. Later in the day I received this wonderful picture of Jim and Betty Welch. 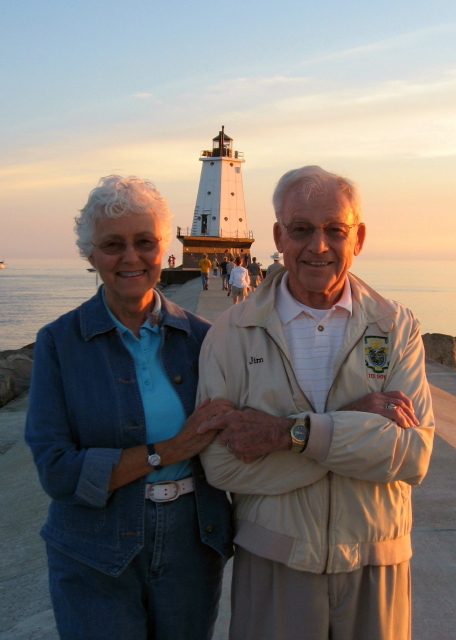 This picture of Jim and Betty was taken on the breakwater in Betty's hometown of Ludington, Michigan. This is Betty's favorite place. The tradition there is to walk out to the lighthouse every evening to watch the sunset. Betty suggested this is better than a walk in the park. Looks to me like it would be beautiful at sunset. Betty is the wife and caregiver for her husband Jim. Betty let me know in her email that they are two happy people in spite of Alzheimer's. Betty also mentioned they have tons of photo albums to remind each of them of their travels and activities together. She ended by writing, Life is good! I am starting to get asked what message I would send to raise awareness of Alzheimer's disease. I think Betty just answered that question for Jim and herself.